Sorry... the 2017 Toyota Tacoma is no longer being sold as new. Instead, take the first step to a great deal on 2019 Toyota Tacoma with a free price quote! 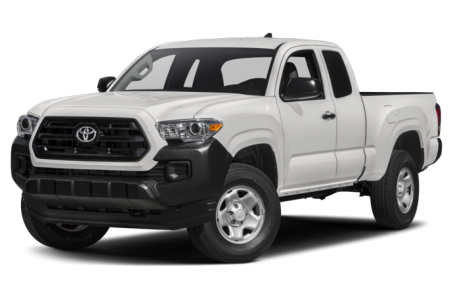 The 2017 Toyota Tacoma is a mid-size pickup truck with two cab bodystyle options: Access and Double. It competes with the Nissan Frontier, Chevrolet Colorado, and GMC Canyon. This year, it receives a new off-road-tuned TRD Pro version. Other available trims include the SR, SR5, TRD Sport, TRD Off-Road, and Limited. The TRD Pro version has rugged styling that includes black 16-inch alloy wheels with all-terrain tires, an aluminum front skid plate, LED fog lights, projector-beam headlights with black bezels, and TRD badging. The interior of the TRD Pro features leather/heated front seats, a leather steering wheel, a power-sliding rear window, a TRD shift knob, and TRD Pro floor mats. Safety features include rear parking sensors and a blindspot monitoring system with rear cross-traffic alert. Last year, the Tacoma received updated exterior styling. The hexagonal, front grille is prominently displayed between the headlights. Large letters spelling “Tacoma” are stamped into the tailgate. The Double Cab comes with a short (5 feet long) or long bed (6-feet long). An SR5 Appearance Package includes body-color fender trim, a power-sliding rear window for the Double Cab model, and 16-inch alloy wheels. Other available features include power/heated side mirrors with turn signal indicators and a trailer hitch receiver. Under the hood, the Tacoma is powered by a standard 159-hp, 2.7-liter 4-cylinder engine mated to a 6-speed automatic transmission or a 5-speed manual and rear-wheel drive (RWD). A more powerful 278-hp, 3.5-liter Atkinson cycle V-6 mated to a 6-speed manual or automatic and RWD. 4-wheel drive (4WD) is also available for both engine models. The V-6/Automatic/RWD/Access Cab configuration has the best EPA-estimated fuel economy rating of 19/24 mpg city/highway, while the V-6/Manual/4WD/Double Cab configuration is the worst rated at 17/20 mpg. Inside, the Tacoma has a standard cloth interior with rear seating. The center stack features a standard Entune audio system that includes 6.1-inch touchscreen, CD/MP3 playback, Bluetooth connectivity for phone and audio, Siri Eyes Free mode, and a USB port. It can be upgraded with a 7-inch touchscreen, an integrated navigation system, and a JBL premium audio system. Standard features include a tilt/telescoping steering wheel, power windows/locks, and air conditioning. Available features include leather upholstery, a Qi wireless smartphone charging station, heated front seats, dual-zone automatic climate control, remote keyless entry, and a power moonroof. Standard safety features include a backup camera and a tire pressure monitoring system. Available features include a blindspot monitoring system, rear cross-traffic alert, and rear park assist. 158 of 174 (90%) consumers said they would recommend this vehicle to a friend.